The release of BackupAssist v7.1 is only a few days away now so I thought it would be the perfect time to introduce one of the great new features, the ‘Exchange Granular Restore Console’. This new add-on replaces the existing Exchange Mailbox add-on and provides a much more flexible and powerful backup of user’s mailbox data. Unlike the previous Exchange Mailbox add-on, the new Granular Restore Console doesn’t require you to take a secondary backup of the Exchange Mailbox to be able to selectively restore specific user mailbox data. This great improvement saves significantly on the space and time it takes to backup a Microsoft Exchange server using BackupAssist. Before I show you how it works, it’s worth noting that support is only available for Exchange 2007, 2010 and 2013. If you are still using Exchange 2003, when you buy the new add-on you’ll also be entitled to the original Exchange mailbox add-on if required. The Exchange Granular Restore Console can mount and access any backup taken in BackupAssist that contains the Exchange ‘.edb’ database files. This can be an image, file protection, or even Zip Archive job. As long as a backed up previous version of the ‘.edb’ file can be accessed the Restore Console can drill down into it and restore the relevant mailbox data. Method A is a traditional VSS backup of the file system that includes the .edb file. 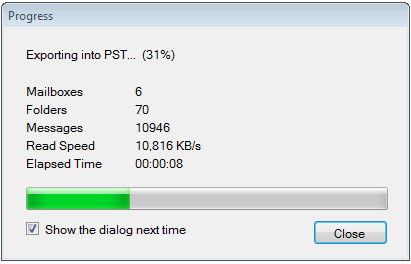 Previously this could only be used to restore the whole database back to a previous point in time. Method B is the New Exchange Granular Restore Console that mounts a previous ‘.edb’ file. 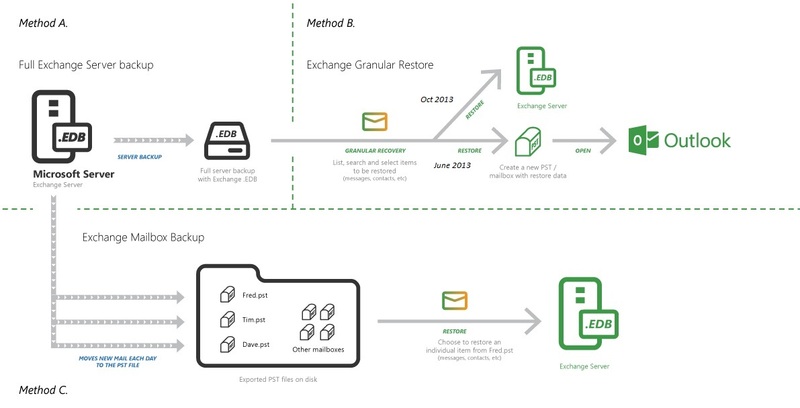 Method C is the existing Exchange Mailbox add-on that connects and takes a secondary backup of the exchange mailbox data and stores it within pst file format containers. From the BackupAssist restore section you will now see a new ‘Exchange Granular restore’ option along side the existing MailBox Protection restore wizard. Backups taken with BackupAssist 7.1 and later that contain any ‘.edb’ files will now be displayed. You can filter these results to help find a specific dated version of the exchange ‘.edb’ file. Its now just a simple case of attaching the PST into Outlook to move the items back into the users specific mailbox. 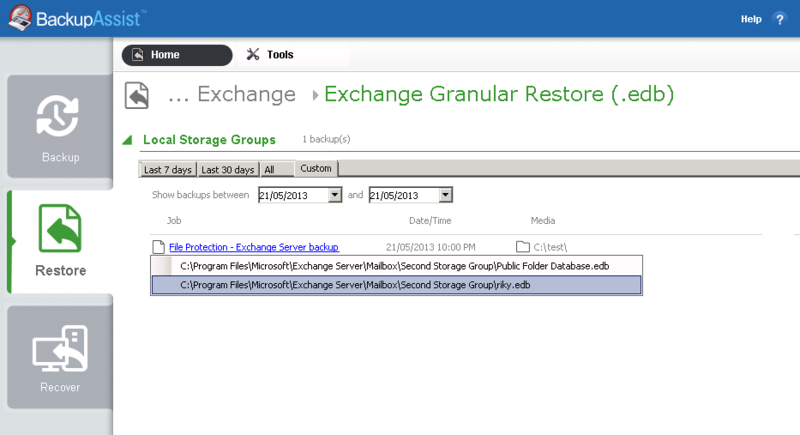 Using the Exchange Granular Restore Console, BackupAssist will now backup an exchange server in one pass saving time and space, including Exchange 2013 which was previously unsupported. 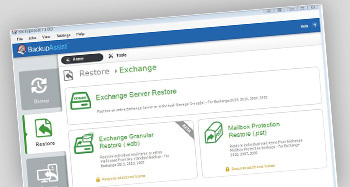 A user’s mailbox or even specific individual emails can be easily found and recovered from any historic backup of the ‘.edb’ exchange database file and stored in a outlook mountable PST file format. ← Employee left the company? What should you do with their MailStore email archive?